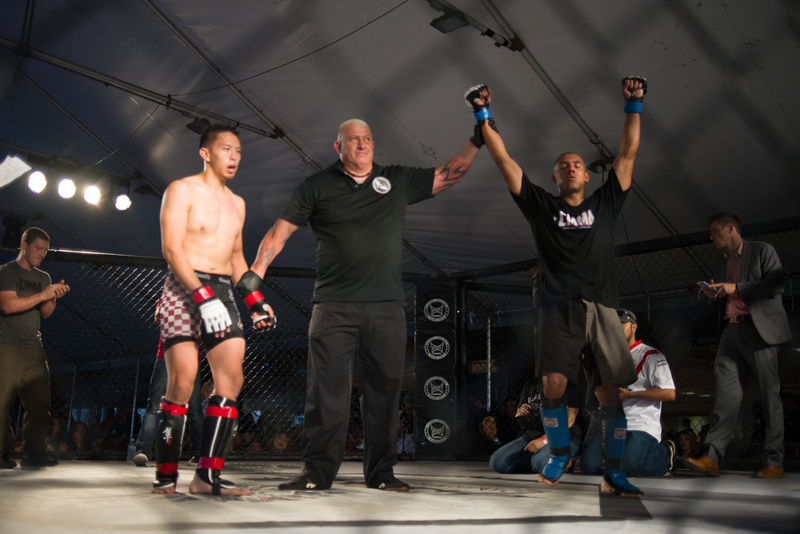 Last Saturday night, Daniel Yeh and Wilber Gonzalez faced off against each other at “Spar Star”, an amateur MMA event put on by Spar Star promotions and sanctioned by the California Amateur Mixed Martial Arts Organization (CAMO). Both fighters are in their mid-twenties. Both have spent a comparable amount of time training in the sport, and Saturday night was the first time either one of them entered the cage. That's about where the similarities end. Yeh, an electrical engineering graduate from UCLA, grew up with a middle class family in a quiet suburb town of the Inland Empire. 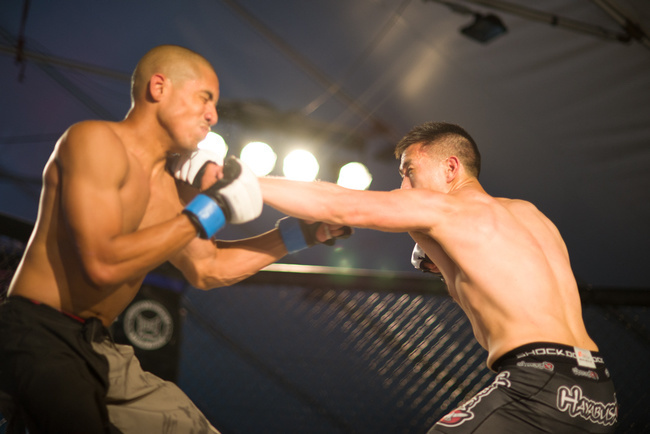 After a friend introduced him to Pride, he began adding boxing and kickboxing to his already established background of high-school wrestling and judo, spending three years total of complete MMA training before finally landing his first fight. Yeh is also a self-described amateur musician, amateur chef and tutors kids on the side, facts that he plays down with considerable humility. Overall, a well-rounded and likable guy. Gonzalez, on the other hand, fits the profile of a fighter that I am more accustomed to speaking with. Raised by a single immigrant mother from El Salvador, he grew up the oldest of three in the rough part of town and worked part-time jobs as a Hollywood valet to get by. He started boxing at eighteen to stay out of trouble, but after a few years decided not to pursue the sport further because he thought he was too old. After seeing that plenty of the bigger names in MMA had a later start in the sport, he decided to make the shift and began learning the needed tools. 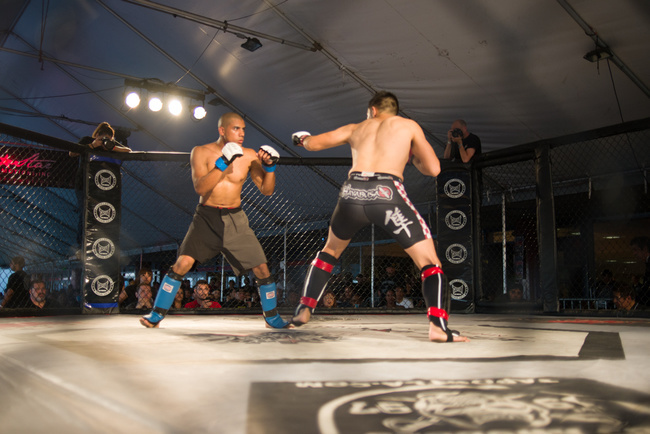 He held about two years of complete MMA immersion by Saturday night. All pertinent factors considered, the two were fairly well matched on paper. Age, experience, and training backgrounds were for the most part equal, and it’s safe to say that Spar Star did a good job matchmaking the two for their respective debut fights. The biggest and perhaps most crucial difference between the two, however, was the reason they were entering the ring and what else they had waiting for them on the outside. Yeh works full-time as a radio chemist at the Ronald Reagan Medical Center. Gonzalez works part-time at Papa Johns. Yeh views the fight as an experience. Gonzalez views it as a way out. Yeh plans to keep his venture in the sport to the confines of the amateur circuit. Gonzalez wants to let the pros take him as far as he can go. "I think fighting is inherent in human nature and anyone who watches competitive fighting has some sort of sense of wanting to compete," said Yeh. "I have no plans of going pro. As a fan of the sport and someone who practiced an art, I want to experience the work, pains, and reward fighters have to go through." "I’m getting into that age where I really need to start seeing how I’m going to make money and it’s tough. They told me I could fight and I could get a little bit of money and I thought that'd be good. It's just the fact that I felt it was something I was good at, something that I could do, and it’s kind of like a dream. You just picture yourself winning and being good at something, you know?" 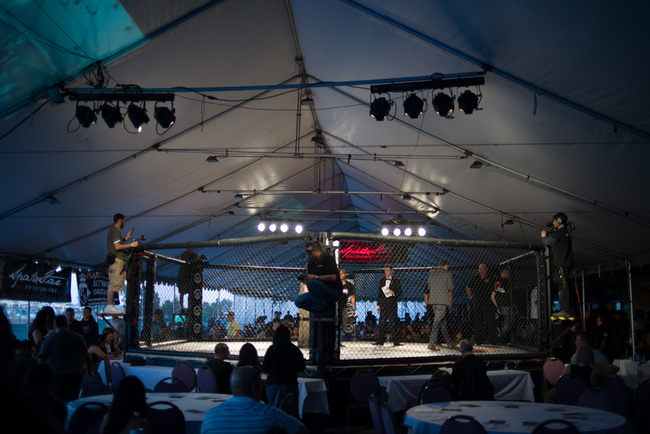 My fight-writing origins are in boxing, and most of the backstories I hear are similar to that of Gonzalez, but what I’ve found in writing about MMA is that the fighter backgrounds are a bit more varied. Given the training costs of acquiring the necessary skills, it’s not surprising that some of the sport’s practitioners don’t all come from rough beginnings, and if we’re to believe self-reported training regimes, then Yeh actually trained more between the two (Yeh’s two-a-days/seven days a week to Gonzales’s two-a-days/five days a week). But he also didn’t have that same imminent sense of desperation in life, a factor that Yeh was well aware of. "I know at the end of the day, although I've trained as best as I can, I don't have the same level of confidence as someone fighting to put bread on their table. This isn’t just about improving themselves. It’s about providing for their family. I think there’s a level of drive that can give them an edge," said Yeh. "That being said, come fight day, it isn't the effort that is put in, but the objective skill each fighter possesses." So the question posed at the center of this match-up was how much does a fighter’s life factor into a their performance, and if need be, could it overcome objective technique? In my view, both fighters had places where they could have unraveled. Without that sense of pressure from limited options in life, Yeh may not have that extra place to dig when the fight gets tough. 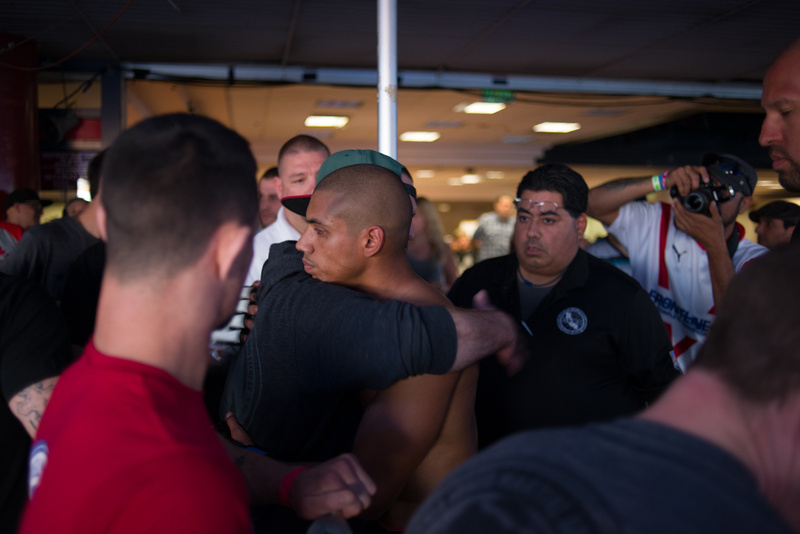 On the other hand, there were moments in speaking with Gonzalez that suggested a history of being told he wasn't good enough, and the dangers of succumbing to doubt could prove fatal come fight night. Either way, with all the additional backstory, the fight suddenly became much more interesting on Saturday night. 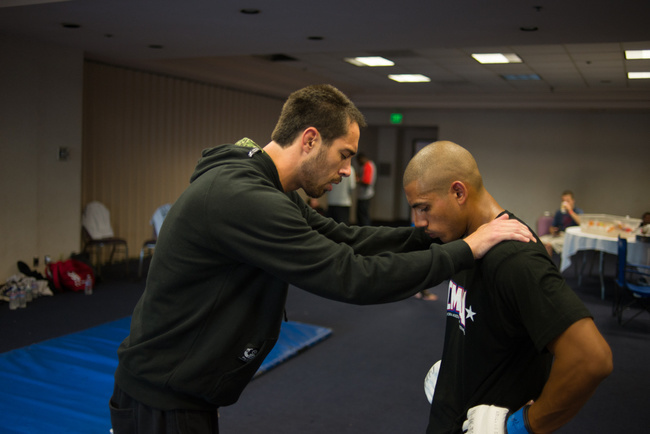 A teammate gives Gonzalez some final encouragement before the fight. The fight is being held in an open area of the Hollywood Park Casino, a building that looks like it could belong on the Vegas Strip. There is a strong community feel to the overall atmosphere as children and families are scattered around the venue. I show up late and the time for well-wishers to see the fighters in the warm-up area is over. After clearing a series of media hurdles, I'm allowed access to the backroom and finally meet the two fighters in the flesh. On the other side of the room I see Gonzalez doing pummel drills with his coach. Maybe it was the soft-spoken attitude over the phone or the fact that the bout is being held at 145lbs, but he is much bigger than I expected him to be. Broad shouldered and wide chested, Gonzalez looks like he could be a solid 170lber entering the ring. None of the traces of self-doubt heard in our conversation come through in his demeanor. Instead there is only a stern look of focus and determination on his face. Both fighters report feeling relaxed and confident, but there's also an undeniable sense of nerves in both corners. The second fight falls through and both fighters are called in early. Officials go through the run down with both fighters: who is walking first, what order the entourage walks, how to enter the ring, etc. 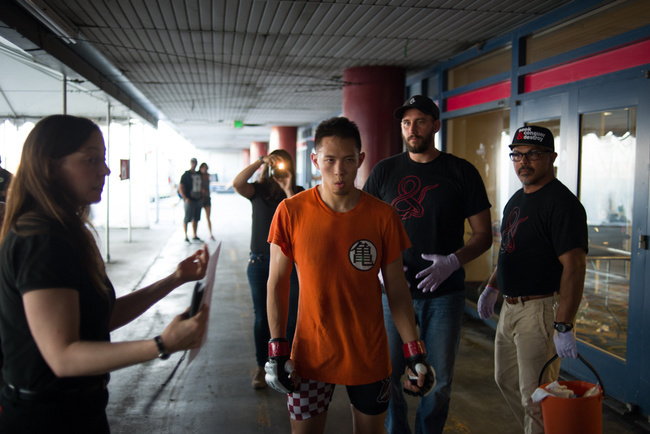 Yeh enters first and starts in a crouch position before walking slowly to the cage, raising his hands in intermittent spurts to acknowledge those who came out in support. Gonzalez’s walk is much simpler. He runs, almost sprints, to the cage and enters in about half the time of Yeh. I hear some boos being thrown around as he enters. 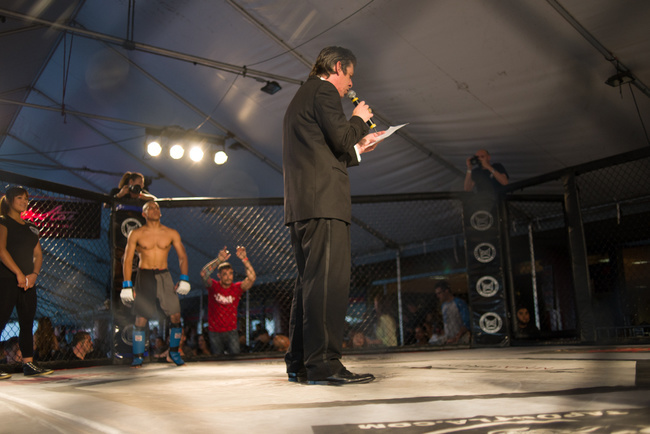 The first round starts and the fighters dance around for a few moments, testing the waters, as expected for two people fighting in a cage for the first time. The two finally exchange blows in the center of the ring, and Yeh then goes for a single-leg that’s quickly countered by a sprawl from Gonzalez. The fight gets taken to the ground with Gonzalez holding dominant position for the majority of the time before the bell sounds. Round 1 to Gonzalez. The beginning of round 2 sounds and Gonzalez is showing his pugilistic shine by making Yeh miss a five-punch series. Yeh eventually lands a couple of flush shots and Gonzalez reacts by taking him to the corner, getting an underhook beneath the knee and body slamming him onto the ground. The crowd cheers upon the impact. After some back-and-forth ground wrestling, Gonzalez gets the back and is a few moments away from locking in a rear-naked choke. Yeh protects himself fittingly and is saved by the bell. By the end of the round Gonzalez has a bloody nose. Yeh’s upper-lip is beginning to swell. Second round goes to Gonzalez in my observation. The third round opens with a series of exchanges and Yeh hits his opponent flush in the face. Gonzalez has a slight look of surprise, but doesn’t back down. There is a similar look of determination in Yeh’s eyes, as something appears to have shifted since the two rounds previous. 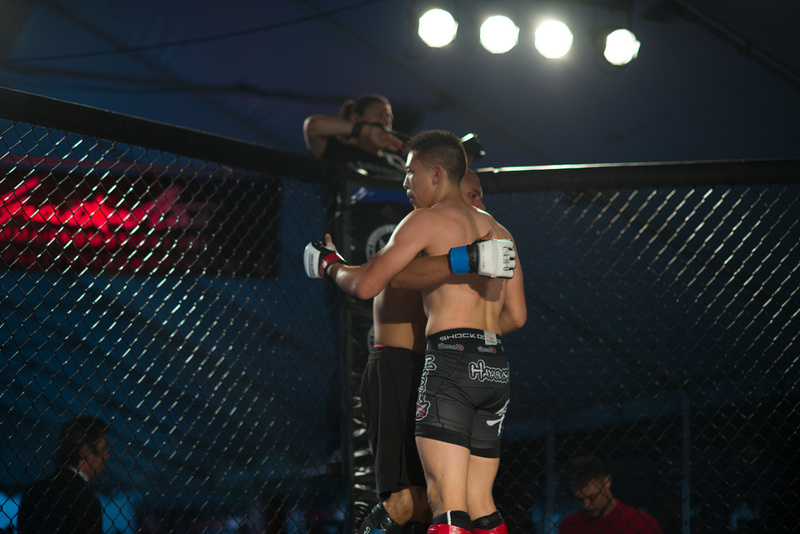 Yeh gives a spirited stand-up performance and equal effort on the ground, but is eventually locked in a tight D’Arce choke as the bell rings to signal the end of the third stanza. The fight is scored aptly with Gonzalez winning on all three judges’ scorecards. At least in this instance, Gonzalez makes a case that life circumstances do make a difference in the fight. There's a glow in the Gonzalez corner after the bout. A small woman comes by and yells out in Spanish, "You're my hero!" Gonzalez is looking down at the pink copy of the fighter registration form and a teammate comes by to tell him to frame the form and save the hand wraps, saying they’d be good memorabilia to look at when he’s older. Judging by the smile and nod from Gonzalez, he thinks it’s a good idea. He tells me excitedly that another fight is already lined up for him and it seems that he’s well on his way to the fight career that he’s hoping for. In the other corner the attitude is a bit more somber, but Yeh is still cheerful enough to speak. His take on the fight is considerably more analytic, mentioning things like the “fight-or-flight” mechanisms and stylistic assets. The size and strength of his opponent surprised him, and tells me he fought ten pounds over his normal competition weight, not wanting a weight cut to be a concern for his first fight. Overall, he’s happy that he never gave up, but disappointed he didn’t get the win. 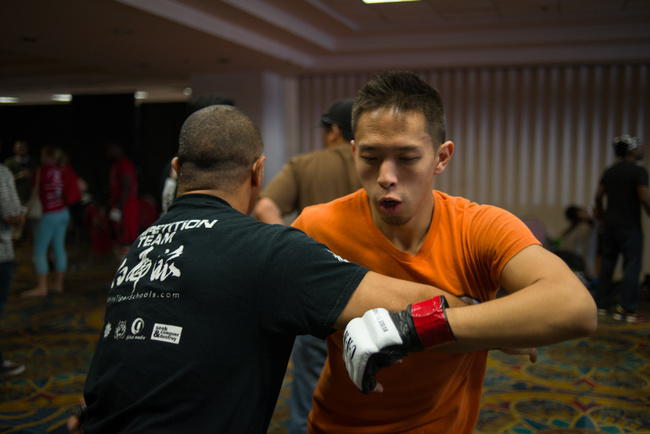 Another fighter warming up for his bout comes by and asks Yeh about the fight. Judging by his build and look, I’d peg him for a serious contender. Yeh tells him that it went well, but he lost a decision. The other fighter sort of scrunches his face at the bad news, then says to him, "Well hey man, you showed up, and that's what matters." Yeh goes on to tell me about how cool everyone has been throughout the experience. 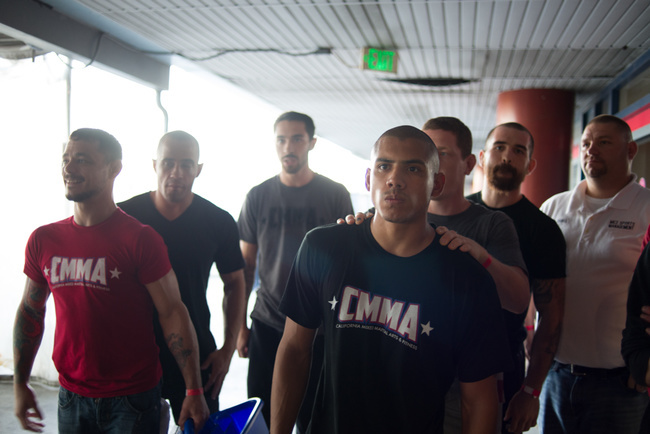 All the trainers and competitors involved made him feel welcomed and gave him the sense that he belonged as a fighter. He says he plans to fight again and I hope that he does. Despite the loss, he went up against a bigger, stronger guy who is trying to make a career out of fighting, and fought through to the end of the fight. That's a lot more than what most fans of the sport can say.